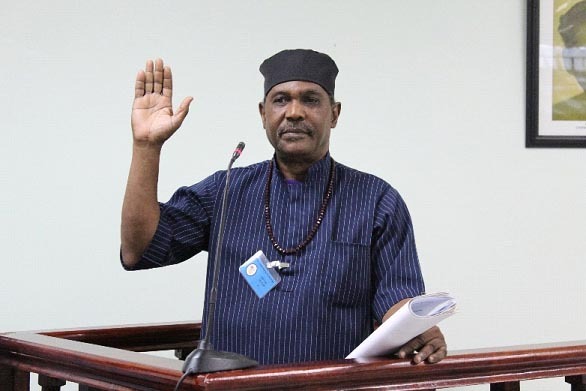 Leader of the Descendants of Enslaved and Manumitted Africans of Guyana Noah Yahshuarun was yesterday accused of seizing control of land belonging to a family at Friendship, on the East Bank of Demerara. 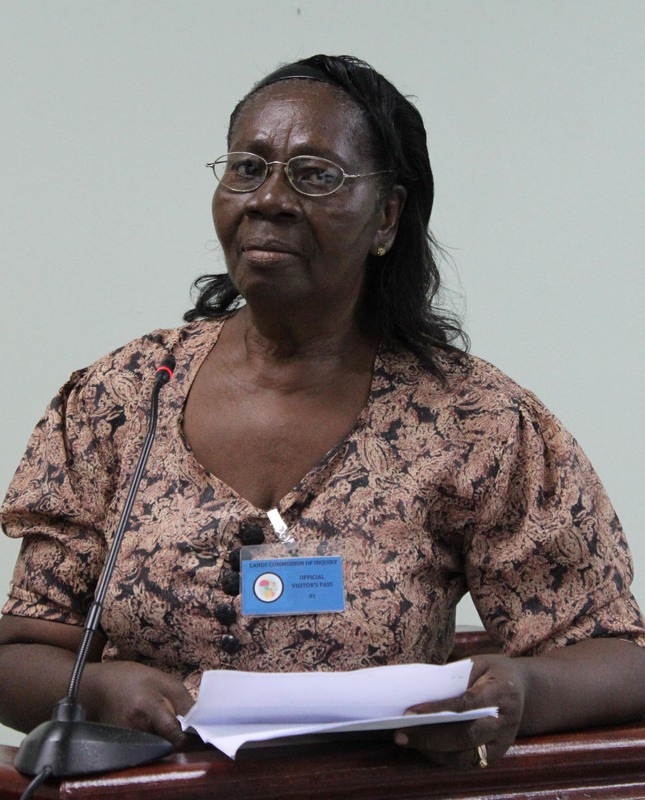 The accusation was made ahead of Yahshuarun’s second appearance before the commission of inquiry into ancestral land issues at the Guyana Lands and Surveys Commission head office. Isla Barry testified that after her brother’s death, Yahshuarun had been made the power- of-attorney for the family’s estate, including land that she said was passed down by her great-great-grandfather, Robert Roberts, who was one of two persons that had purchased the village of Friendship. The other name that appears on the title is Francis Moore. Barry said that Yahshuarun had promised to assist the family in having the land distributed to family members, but added that she later learnt that he had his own interests in the property and that he had sold some of the land to three persons, including himself and his son. Yahshuarun’s defence, however, was that he had been gifted the land by the very people levelling the accusation against him. Barry said that she had Yahshuarun’s power-of-attorney status revoked after she found out he was trying to get the land for himself. Barry stated that while she knew he had applied for title of the land, she was unaware of whether he had been successful in acquiring it. She noted that after she found this out, she sought advice from a lawyer and had a caveat placed on the land. When asked by Commissioner Carol Khan-James whether she knew that Yahshuarun had also had a caveat placed on the land, Barry related that she had heard as much. Yahshuarun, on the other hand, claimed that the administrators of the land, including Barry, gifted portions of the land to him. He stated that the descendants of Robert Roberts are laying claim to portions of the plantation that were not yet divided up, and argued that they were cheating the other land owners out of their share. “…The court has appointed a few descendants of Robert Roberts, whose name appears on the transport, as administrators ad litem and they have made me the power-of-attorney. And so I have some lands there. I already applied to the land court for the lands, which they gave to me… They saw me on the television some years back and they invited me to come help them. I did help them legally and they rewarded me with some lands. So I have interests at Friendship,” he stated. Asked by Commissioner Lennox Caleb whether the lands “that you purport to have been awarded” includes land that Barry was administrator over, he went on to relate a story about the land being sold by one man to a Hussain Mohammed, and said that the matter was placed in court by a Garfield Aaron. “Isla and Joyce [King], they have caused the matter to be abandoned, and so legally, Hussain Mohamed is still the owner of the land. They don’t own that piece of land, they lost it. I told them to keep quiet about it but they’re still making noise…if anybody goes tomorrow and squat on it, they can do nothing. Absolutely nothing, because Hussain Mohammed has title…and I have not surveyed any of the lands. I surveyed 18 pieces of land…I built a bridge, I dug drains, I laid out the roadways, and it was a virtual swamp. Now that that is done, a bridge is built, the water is gone, they want back the land that they gave me or some of the land that they gave me. But I did not interfere with any of the land concerning them. 18 pieces, that’s all,” the witness said. Asked how he thought the matter should be treated in the interest of fairness, he told the commission that all beneficiaries should be entitled to the land, not just Robert Roberts’ descendants, as according to the witness, all plantations were purchased by groups of people but only one or two names were allowed to appear on the transport. “…So, we have a situation today where the descendants of Robert Roberts, they are laying claim to a certain part of the estate which was not yet divided up, to the exclusion of the other 49 purchasers. And so this is something which the commission should rectify whenever the time presents itself so that we will know that all those plantations were purchased by more than one or two persons,” he stated. He opined that this was so for all plantations, not just Friendship. In the case of Friendship, however, he related that there had been a file at the deeds registry listing all the additional owners, but said that has now gone missing, and speculated that Barry’s family may have been responsible. “I think the descendants of Robert Roberts have been unfair to the other joint owners, in ignorance or unfairly. And if they pursue this matter, it will be harmful to them because they have been dishonest …to the other share owners. I think they should accept what they have and move on with their lives. They’ve gotten enough—they’ve done a lot of things—there is an arrangement in which about 400 squatters, we entered into an agreement of settlement with them. And they’re paying this money into the bank. The agreement is that they must pay $30 a square foot for the house lot that they occupy, and they’re paying it to the bank and Isla Barry and Joyce King solely are drawing that money and using it for themselves. And many other irregularities and dishonesties are being committed there. If they want to pursue it, I have no problem,” he stated. Yahshuarun said he has not yet received an official notice that his power of attorney status has been revoked. Furthermore, he asked to be provided with a copy of Barry’s allegations so he could address all aspects of the claims made.